From left, JKC Provost Monica Weaver, with student speakers Anya Roberts, Carmen Hernandez (with daughter), and Leger Cyrise. Not pictured: William Glover. From left, Byron Pelechu, donor Edward Kahn, Diego Cabrerra, Angell Kemokai, MCCC Vice President Ed Gwazda, Ronez Wilson, Nina Benson, Tia Jones, Rodney Baines, Executive Dean Diane Campbell and President Jianping Wang. Sixteen students received Kahn scholarships to begin their studies at Mercer in the fall. 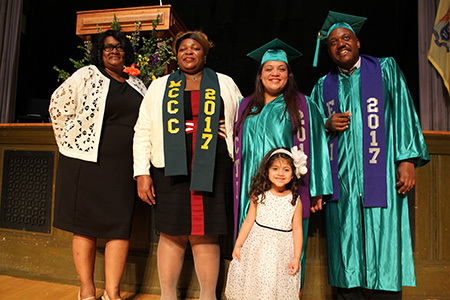 Students celebrated all levels of achievement, including associate degree candidates who have made the Trenton campus their home base for learning. 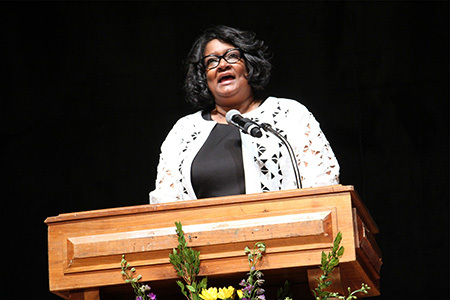 Provost Monica Weaver encouraged students to continue to "chart their own destiny." 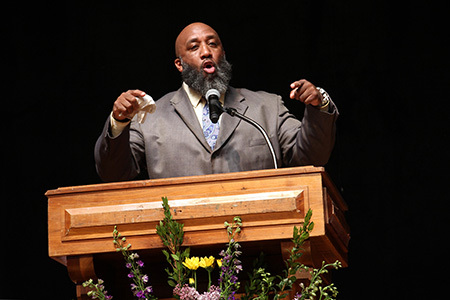 Darren "Freedom" Green, a well-known motivational speaker and activist, reminded students that nothing can stop them from achieving their dreams. Trenton, N.J. – In its annual salute to graduates, Mercer County Community College’s (MCCC’s) James Kerney Campus (JKC) packed the Washington Ballroom at the Trenton War Memorial with close to 200 students and their family members for its 29th Celebration of Academic Achievement. Held May 2, the event recognized the completion of a program of study for students who have made the college’s Trenton campus their home base for learning. Weaver emphasized JKC’s continued impact in the Trenton community. Annually, the campus serves over 3,000 students, along with approximately 1,500 teens through Youth College programs. Most recently, the college completed the construction of Trenton Hall, located on Broad Street across from the James Kerney Building. The state-of-the-art facility houses programs in Fashion/Apparel Design, Fashion Merchandising, Security Systems Technology, Cybersecurity, and Allied Health Professions. Also located in the building is the Gallery at JKC, which has hosted two photography exhibits since opening in February. Dr. Wang acknowledged long-time donor Edward Kahn, who presented scholarships to 16 students. “Many here tonight are receiving scholarships because of Mr. Kahn’s tremendous generosity. He believes in all of you and he believes in the power of education,” she said. Then it was the graduates’ turn to share their stories. Returning adult student Anya Roberts, who will earn her associate degree in Education later this month, recalled an academic journey that was delayed due to health issues. Her first step upon returning to school was earning her HSE. Once she passed that exam, Roberts immediately registered for college classes. By the spring of her first year, she was awarded a scholarship to help her along the way. She plans to transfer for her bachelor’s degree and to work with children with special needs. “I have had great professors and a wonderful support team,” Roberts told the crowd amid cheers and applause. Roberts was twice named to Who’s Who Among Community College Students and served as secretary for the JKC Student Executive Council. She was a guest speaker for JKC’s 2017 Martin Luther King Day ceremony. “It was not an easy task, but it was well worth it. You can make it despite your obstacles. You can be your own greatest inspiration if you never give up and never give in,” Roberts said. Representing CTI graduates was Carmen Hernandez, who returned to school following the birth of her daughter in 2013. “She inspired me to take a new path,” Hernandez said. In 2015, she received her HSE and, having received her certificate as an Administrative Assistant, she is now studying Cybersecurity. “My goal is to provide for my child and to become a hero in my own life. I want to be the best parent and best citizen I can be,” Hernandez said. Also speaking were Leger Cyrise, an ESL student who is gradually removing his language barriers at MCCC, and William Glover, who returned to school at the age of 38 and earned his HSE; he is currently enrolled in the CTI program to earn his Culinary Certificate. 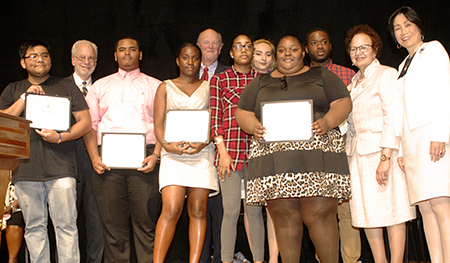 MCCC Vice President Ed Gwazda presented scholarships to 25 students. “We applaud our donors, who recognize the power of education to change lives,” he said. “It is an honor and privilege to distribute scholarships to students whose lives will be changed through the power of education."